A 5.6 magnitude earthquake has struck Tokyo and nearby areas, the Japan Meteorological Agency said, setting off alarms and halting the city's subway system. 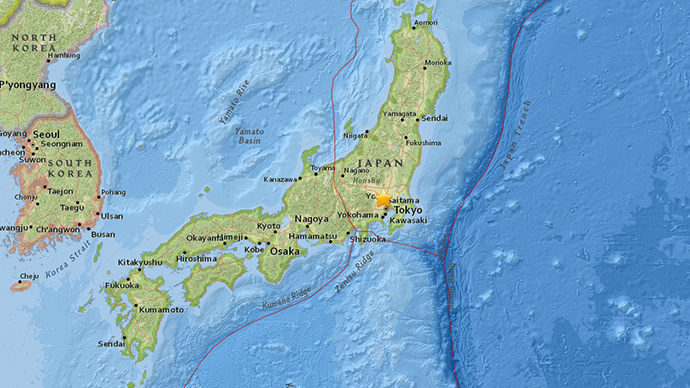 The earthquake struck at about 2:28pm local time at a depth of 50km, weather services reported.USGS, however, put the Japanese earthquake at a magnitude of 5.3. The quake was centered in Ibaraki Prefecture, Kanto Region on the main island of Honshu. The prefecture has a population of about 3 million. According to the US Geological Survey, the quake took place 34km from Tokyo, a city with a population over 13 million. It also struck 2km from the town of Hasuda and 3km from Shiraoka. That's a lot of shaking for a 5.6 magnitude. http://t.co/sHV5338ht8 Be cautious, Tokyo! The agency hasn’t issued a tsunami warning and there have been no reports of damage or injuries yet. Tokyo’s Narita International Airport closed both its runways following the quake, Reuters reported. Nissan and Honda motor companies, as well as Fuji Heavy Industries and Hino Motors have plants near the epicenter of the quake. Earthquake that just gave Tokyo a good shake was 5.6 magnitude, NHK says. Nissan, Honda, Fuji Heavy, Hino have plants near epicenter.